As former events coordinator for Summerville Saltwater Anglers, I began a partnership with SCDNR’s SCORE (Oyster Restoration) team to begin planting oysters in the Ashley River. One of the missions of the club is to provide community service to the Ashley River to improve it as a whole. This was 5 years ago, and each year we have had a planting event in July, peak time for “spat” or larval oysters to be floating around looking for something to attach to. We recently had a speaker from SCORE come to the club and review our progress. This past weekend we planted 400 bags of oyster shell substrate. They have a formula that predicts the number of new oysters that will “recruit” on each bag and what it will filter at maturity. When mature, the reef we planted will filter an estimated 40,000 gallons of water per hour. Well, since we began, we have planted approximately 3,000 bags of oysters, and if you go back to the first year’s reef, it is now a full grown, live, oyster reef with big blades growing up off of it. Really good stuff. There is nothing better you can do for our marine estuaries than plant oysters. From filtering the water, to creating the beginning of the food chain that leads to our desired game fish – and beyond – think dolphin and osprey, for example. There are many opportunities to get involved. Check out the SCORE program for a calendar of events. The end result. Oysters need to live in the “intertidal zone” where they are sometimes submerged, sometimes not. Secondly, really good news to report – regarding the full funding of the Community and Professional Response Initiative (founded by Redfin Charters, Z-Man Fishing, and Eye Strike) and our first project, named Project ReSpeck. The goal was to raise $25,000 to aid Waddell Mariculture in their spawning efforts that eventually end up as stocked fish in our waterways. This was in response to our record freeze last January and trying to think of a way to help somehow. I’ll let the press release speak for itself. Just want to thank everyone who contributed to our cause. Every little bit helps, and every penny goes to the cause. Columbia, S.C. – This past January, record cold weather set in across the Southeast causing a noticeable fish kill along the entire Palmetto State coast and calling into question the future of several popular species of fish important to recreational saltwater anglers. A conversation by a group of concerned industry parties focusing on what action could be taken to hasten a recovery began and out of that came Project ReSpeck; an initiative to provide $25,000 in funding to establish the ability to spawn, grow, and release spotted or “speckled” trout into South Carolina’s estuaries. 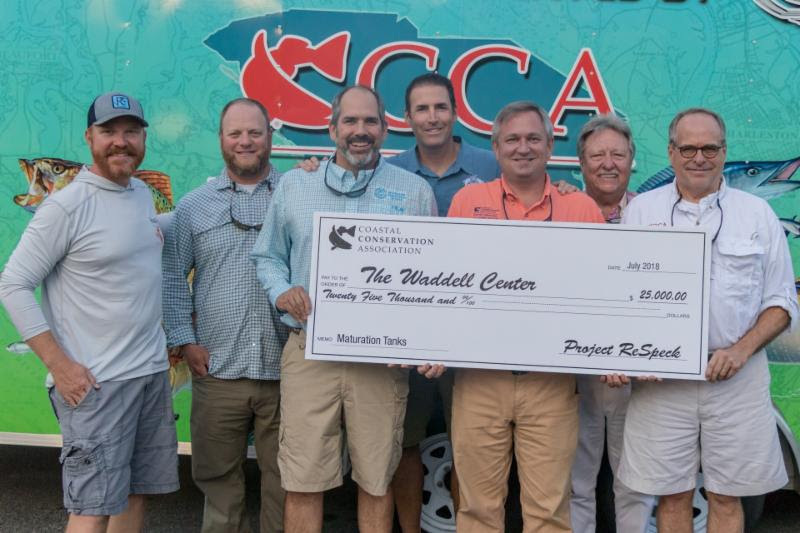 This past Saturday, after months of collaboration, Project ReSpeck and the Coastal Conservation Association South Carolina (CCA SC) presented a $25,000 check to the South Carolina Department of Natural Resources for the installation and operation of five maturation tanks at the Waddell Center in Bluffton, SC. The tanks will provide the SCDNR staff at the Waddell Center in Bluffton, SC with a powerful stock enhancement tool. By simulating spawning conditions in a controlled environment, species such as red drum, spotted sea trout, and even flounder may be produced for the purpose of releasing them into the wild to supplement existing populations. The process could be expanded to include a variety of species in the future. CCA SC was contacted by Daniel Nussbaum, president of Z-man, as wells as David Fladd and Ralph Phillips of Eye Strike Fishing (all Project ReSpeck contributors and supporters) bringing the campaign to the recreational angling advocacy group’s attention. Within 48 hours of learning of the effort, CCA SC had eagerly committed to RedFin Charters, Z-man, and Eye Strike that the organization would match half of the projects goal of raising $25,000 for the tanks, providing $12,500 of the total project investment. One of the things we look forward to every year is going to ICAST. This is the biggest fishing convention in the world, and we are lucky to get passes from our partners, Z-Man Fishing. We try to see what’s new and also drop by the Z-Man booth several times a day to check in with them and see some of their partners and pro-staff that we usually only get to see once a year. The main draw is the New Product Showcase, where all the new products for the year are shown. Often, my personal best-in-show doesn’t match the show’s best-in-show! I’m impressed with true innovation and not gimmicks, and both last year and this year, my best in show were bait casting reels. Last year it was the 13 Fishing Concept Z reel, that eliminated ball bearings for bushings. I own one of them and its a really good reel, and 7 months in, its still going strong. It does have its issues, but overall a very good reel. This year, for me, it was the Shimano Curado DC. DC stands for Digital Control, and it uses a chip to control the spool instead of feathering your thumb. We are told that it has settings 1 through 4. On setting 4 you can throw it against a wall with no thumb and it won’t backlash. That’s incredible! The lower the number the more you might have to feather it, but the farther it will go. Pretty cool innovation from our friends at Shimano! We are very honored to have one of our products be one of Z-Man’s featured products this year, the Weedless Eye jig! As you can see, it was prominently displayed in the Z-Man booth and really well received from what we heard. It’s incredible how fast Z-Man’s profile is rising in the fishing world. ElaZtech rules. Nothing else will stand up off the bottom like ElaZtech. They smartly had several aquariums and tanks displaying the product in-action, which is to say, dead-sticked and floating up. Z-Man also has released a 4″ scented jerk shad that will match up perfectly with the Weedless Eye, we are looking forward to trying this ourselves. There is a new Trout Trick Shrimp that was released that has swimmin’ antenna, and is meant to be presented in a fleeing orientation. Also looking forward to trying these.